Your guests will be very happy with how I am able to capture their likeness. 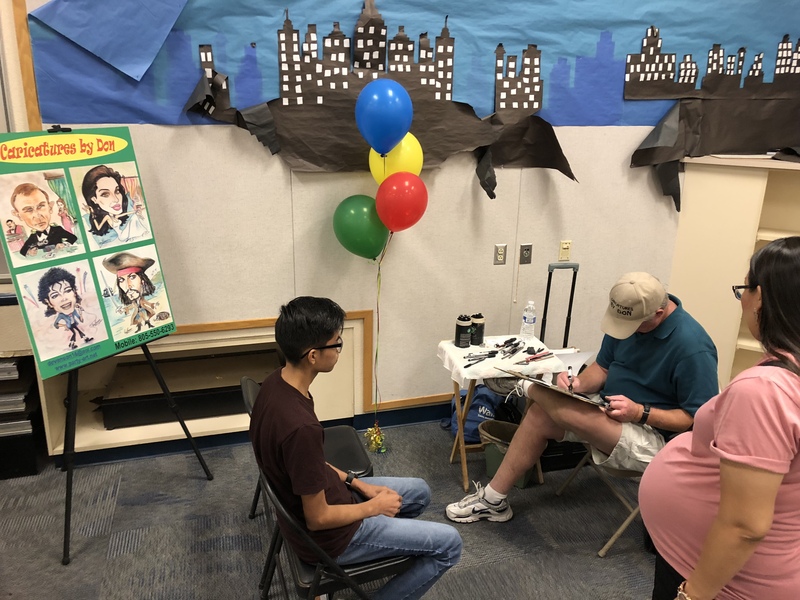 everyone wanted their Caricature drawn. Your won't be disappointed! We were putting on a fall festival and we needed a little something extra. Don was professional, courteous, and on time! He set up his station quickly and the line to see him went out the door. He really added that something special and I'm glad we hired him! Thank You Linda! 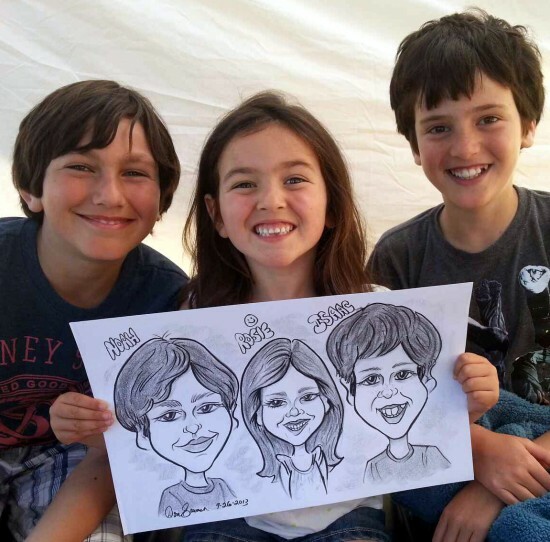 I enjoyed drawing the kids Caricatures and they seemed to really enjoy it too! Overall, a great add to our wedding! Guests enjoyed their caricatures, however, I did hear they were each taking a bit long. I was the bride and chose to opt out because I didn't want to be away from the party too long. Also, rather than guests lining up, we implemented a number system. That seemed to help allow guests to enjoy the festivities without being held up in line. We had 64 guests and I would guess about 25 drawings were done within the four hours. Truly enjoyed our evening - Don did a great job working with our corporate group event and guest really enjoyed his professional and personal touch. Don did a great job for a function with a diverse group of people. He is very professional and easy to work with. Thank you, Maria! 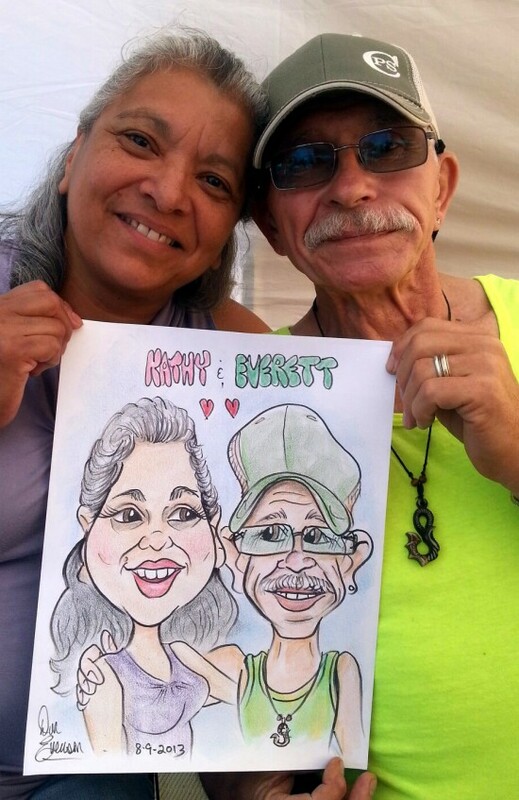 It was a pleasure to draw the folks for your event and it was nice to work with you! It was so much fun! Guests loved this at my wedding! Thank You! 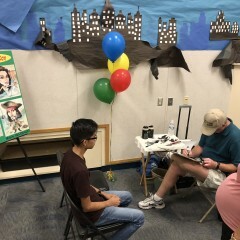 The guests really seemed to enjoy the caricatures! Congratulations for your Wedding! Our event was a success thanks to Don! It was a pleasure working with Don Evenson at our trade show in Phoenix! This was a large corporate event (trade show) with a lot of moving pieces and last minute changes. Don was flexible and responsive throughout the planning process. Don mingled well with our crowd and made sure all felt welcome to the booth. The event was a great success due in large part to Don’s involvement. Lastly, I found his pricing to be competitive and he came recommended to me by the Catering Manager the at hosting hotel. Would highly recommend! I remember him - he's great! We had Don come do his thing for a birthday party for our daughter and about 30 of her friends. Don was exceptional and the kids couldn't wait for their turn for Don to draw them. Definitely someone we will want to come back for the next party we have. 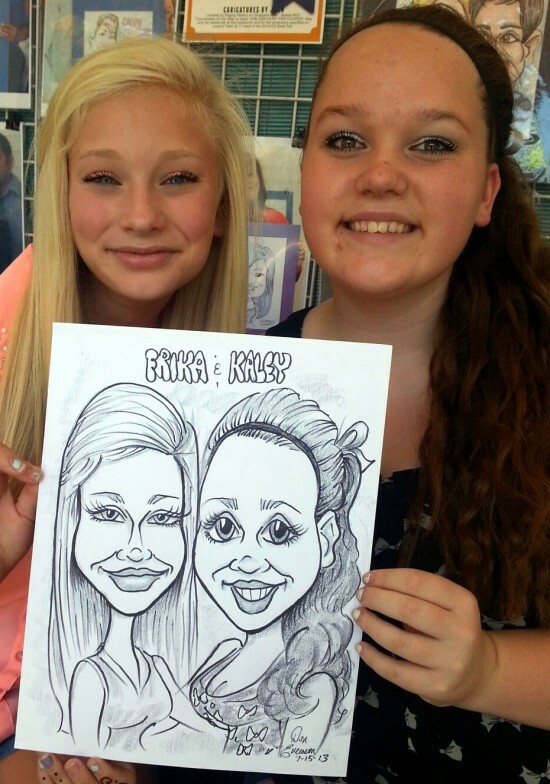 I really enjoyed drawing for your party! Everyone had fun! People hang around to watch! Most of my clients tell me afterwards that I was the life of the party! people I am drawing. They can't wait to see it! 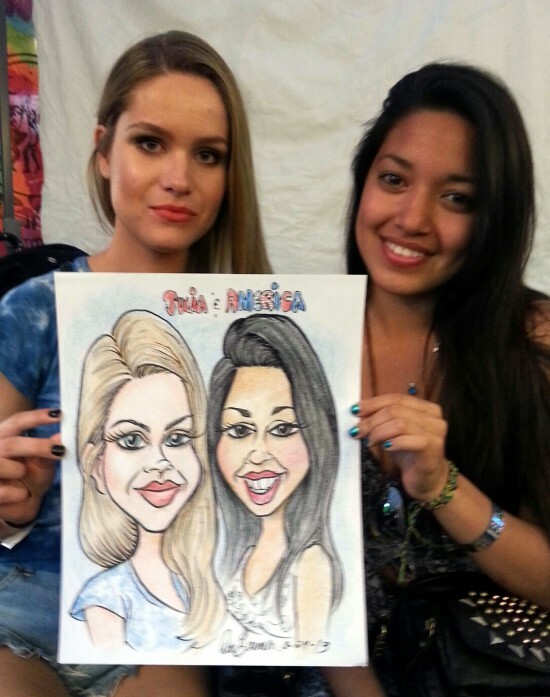 I am a Caricature Artist located in the Phoenix Metro and surrounding cities area. I am also a Portrait Artist which is why I am able to capture the likeness of the person or persons I am drawing so well. This is a talent that I have had since I was a very young man ( started drawing at 5 years old.) Ala Natural - without any formal training.I draw at Birthday Parties, Wedding Receptions, Corporate Events, and Fairs and Festivals. always show up on time and well groomed and professional. I draw between 12 and 15 faces per hour in black and white, head and shoulders with detail and the persons name. Color is 8-10 faces per hour with detail and the persons name. With two or less subjects I draw on card stock vellum paper 11"x14" which is a standard size for a frame. For 3 or more subjects I draw on either 11"x17" or 12"x16". These are all standard sizes for a frame with 11"x14" a bit more common. After I complete the picture I place the picture in a clear plastic sleeve for it's protection. I have chairs, a table, and a sample display board. For festivals or fairs I do have 10'x10' Canopy with a very nice Caricatures banner. Good lighting is a must. This is something clients have a tendency to overlook. If I am inside or outside and it is dark, I would need to be set up near an electrical outlet in order to plug in lights but if it is possible to set me up in an area that already has decent lighting. Prefer not to be set up near loud speakers. I can't hear what the guests are saying. I have chairs but if the place where I am setting up at already has chairs that works for me. Lighting is the most important thing and if it is outside during the day I would need to be set up under some shade so I do not have the direct sunlight shining down on my bright white paper. That can be very blinding!